Nine cars were broken in to this week in a neighborhood in Lehigh Acres. Southwest Florida Crime Stoppers is asking for your help to find the two suspects. 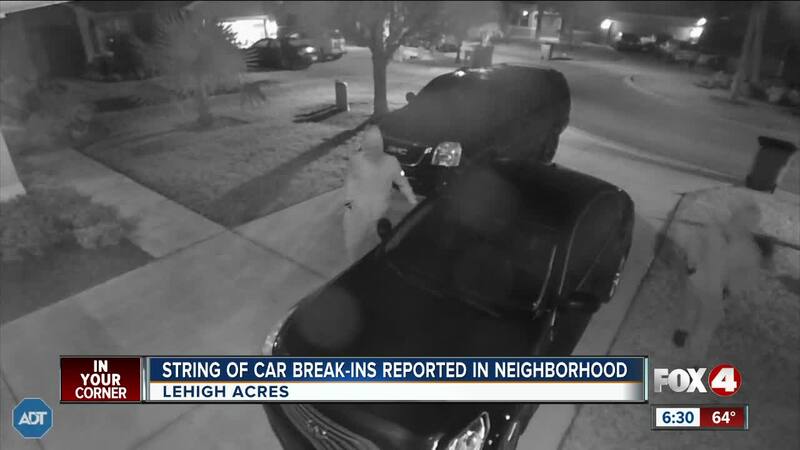 LEHIGH ACRES, Fla. -- At least 9 cars were broken in to in a Lehigh Acres neighborhood. It happened late Monday night into early Tuesday morning on Shadow Lakes Drive and Center Lake Street. Lee County Sheriff's Office is currently looking for two suspects in their late teens or early twenties. “Most likely the suspects are from that area, they seem to be very familar in the neighborhood so maybe they live within a couple blocks,” said Trish Routte, Southwest Florida Crime Stoppers. The surveillance video shows the men walking up to the vehicles trying to see if they are open. According to the release, one of the males is wearing a light grey hoodie and sweatpants, the other a black hoodie and grey sweatpants. Southwest Florida Crime Stoppers is encouraging people to not leave valuables in your car and to remember to lock you doors. Routte says these crimes would have been prevented if the owners of the vehicles locked their car. “Every single time, if you are just running into the house for a few minutes or going home for the night, don’t make the criminals job that much easier,” said Routte. There is a cash reward of up to $3,000. “If something felt or seemed out of place we need to hear form you because that one thing that you saw might be something that can lead investigators to an arrest,” said Routte. If you have any information that can help investigators call Crime Stoppers at 1-800-780-TIPS. All calls are anonymous.